Quartz Worktops | MG Granite Ltd. Alternative man-made materials that MG Granite use give as convincing and complimentary a style as the stone. 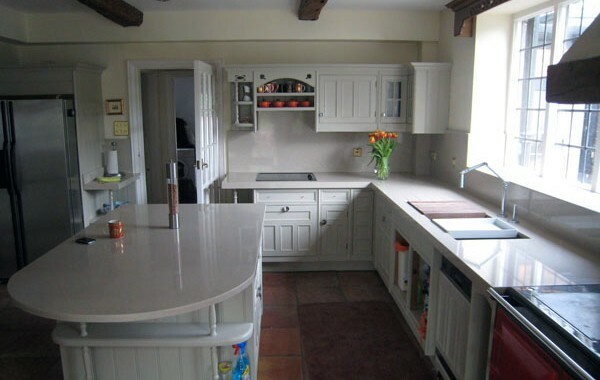 Quartz or composite worktops are developed and manufactured from a mixture of quartz and mica. Once the surface has been set, a resin and colours colourant added. There is a range of colours and visual textures that can be chosen. Our quartz work tops are built and cut uniquely for our customers. We're about giving you the biggest amount of creative freedom in working your design ideas into your kitchen. Quartz is known for its strength, durability and flexibility as a material. Both olours granites and quartz are available in a range of textures and finishes, from our standard high polish to a textured style. Maybe you prefer the unpolished finish for a more natural look, we offer all these options and more.